Click here to visit the Rite Aid site and enter your email. 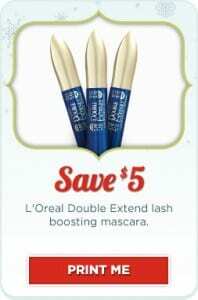 On the next page you’ll be able to print a coupon good for $5.00 Off L’Oreal Double Extend Lash Boosting Mascara @ Rite Aid. I used mine today…I was actually able to get my choice of any of the double extend mascaras. Bonus, they’re having a buy 1, get 1 50% off sale.